Unless you happen to be one of those fortunate souls with an unlimited travel budget and plenty of free time you must be judicious when scheduling your outdoor adventures. For most of us there simply aren't enough vacation days in the till to cover both an annual hunting and fishing trip, but don't let that discourage you. With a little pre-planning you can find a combo trip that will allow you to pack both your reel and your rifle. Combo hunts are a great investment of both time and money. I've found that fishing typically enhances a hunt and vice versa, and there's even a bit of built-in insurance. If the weather is ruining your hunt you may be able to find success on the water. Cast and blast trips are a great way to spend those vacation days, and here are seven of your best bets. Kodiak Island might be known for big bears, but it's also home to some of the best cast-and-blast combo hunting anywhere in the country. In August and September you can divide your time chasing the island's elusive blacktail deer and fishing for lingcod, halibut, rockfish, king and silver salmon in the Pacific Ocean (and, incidentally, these months also happen to be prime time for really big halibut, one of the most delicious gamefish found anywhere). If you're willing to come in October you'll have a chance to hunt waterfowl, too, and this is a great trip for the duck hunter who is looking for northern species like scoters, harlequins and eiders. 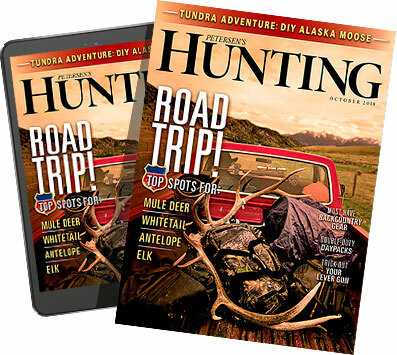 If you've always wanted to hunt the Great North but don't have a great deal of time or money then this is the trip for you. Autumn is a wonderful time to be in the Wyoming wilderness, and if you've always dreamed of a high country elk or mule deer hunt this is one of the best destinations in the west. A pack trip into the wilderness is an adventure itself, but be sure to take a fly rod along with your rifle. That way when you have down time or after you take your bull or buck you can catch enough trout in the surrounding streams and alpine lakes to create a fine wilderness feast. Northern Minnesota's Boundary Waters Canoe Area Wilderness is a vast playground of hidden waters tucked within the Superior National Forest. You can spend the morning canoeing from one fishing hole to the next nabbing pike, walleye, and smallmouth bass, and the surrounding forest areas are home to some of the nation's highest densities of grouse. Fall hunts are breathtaking as the leaves change, cool weather has oftentimes killed the mosquitoes and it isn't hard to find your own little corner of this massive wilderness. America's deepest river gorge, the aptly-named Hell's canyon is home to some outstanding hunting opportunities. There are sheep tags for the lucky few, mule deer, black bear and elk, lots of wild chukar for the adventure-minded bird hunter and the fishing for trout, salmon and smallmouth in the river is excellent. There's also a chance you'll tie onto a massive sturgeon, a prehistoric fish that grows to immense size in the waters of the Snake. Alabama's Black Belt region is one of the most underrated hunting destinations in the eastern United States. This rural portion of the state produces some great whitetail bucks, the season is long and nonresident tags are affordable. In addition, Alabama lakes have a long growing season and you'll have a chance to do some great bass fishing as well. This is an affordable DIY hunt if that's what you're looking for, but you can make the most of a short trip by hiring a guide. Alabamablackbeltadventures.org has an organized list of guides and outfitters in the region so you won't have to do so much homework. The Land Between the Lakes is a strip of land that separates Kentucky Lake and Lake Barkley. The surrounding hills and old-growth hardwood forests are perfect habitat for wild turkeys and there are plenty of birds here. The area has a quota system so you'll have to apply early, but the vast wilderness areas offer plenty opportunity for you to get on a good bird and tag out. Afterwards, you're just a short drive from some of the best bass and crappie fishing that you'll find in the region. Be sure to bring along your breadcrumbs and oil for a fish fry at the conclusion of this combo trip. Matagorda Island attracts tens of thousands of ducks and you won't have trouble limiting out on redheads, pintails, and gadwall. Afterwards, break for lunch and then head out into Matagorda Bay in search of redfish. The weather in Texas is usually mild that time of year and your odds of success are high. Just be sure to bring an extra-large cooler; you're going to be bringing home a lot of great meat.